A tiger never changes its stripes, well neither does a sneaker. Celebrating 50 years of the five-striped K-Swiss Classic 66, one of the first leather tennis shoes to ever be worn in a major Grand Slam tournament, the American sportswear staple has partnered with A Bathing Ape offshoot AAPE for a camouflage re-work. Available from 15 December at End, priced £120. Thought Space Jam was the best thing Michael Jordan has given to the world? Well, you’d be right. But the sports mega-star also has a pretty killer line of basketball kicks. Just in time for winter, his airness’ iconic 1988 silhouette – the Air Jordan III – has gained a new heather grey wool upper, finished with tonal Jumpman branding on the tongue and heel. Available from 17 December at Size, priced £165. And the award for the most unusual sneaker mash-up of the year goes to… Celebrating 90 years of German power tool manufacturer Stihl, Australian brand Kangaroos has created a special edition runner crafted from rich, soft suede in the exact same colour scheme found on the firm’s heavy duty chainsaws. Available at Hanon, priced £215. Mooo’ve over Yeezys, we think Le Coq Sportif’s latest collaboration with French boutique Starcow has just gone to the top of our sneaker wish list. Yes, updating the decade-old Omega model with pure grain leather, cognac suede and longhair calfskin is an udderly ridiculous idea, but just look at them. Available from 17 December at Hanon, priced £175. Well known by all sneakerheads worth their salt, the Puma Prevail hasn’t been seen since the nineties. Rising from the dead in time for Christmas (doesn’t Puma know that’s an Easter thing? ), the retro runner is back with all the OG features including a mix of mesh, nylon and leather in an eye-catching white and purple colourway. Available at Foot Patrol, priced £80. It’s fair to say, these days Pharrell Williams is just as renowned for his contributions to the sneaker world as he is for his music. 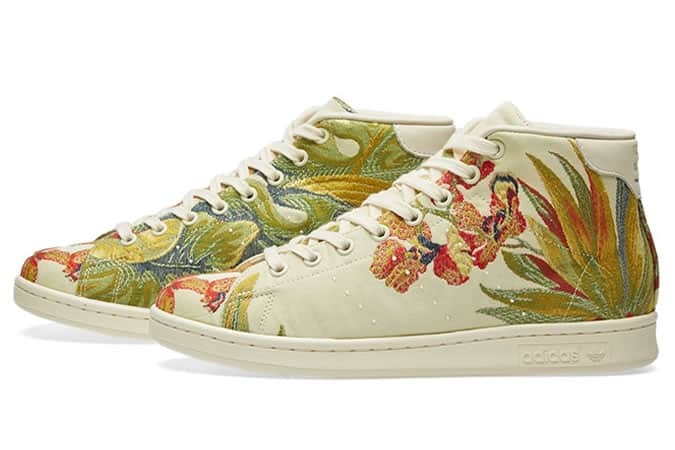 Teaming up with Adidas once again, the creative pop icon has draped the Stan Smith Mid in some seriously opulent embroidered designs. Available at Foot Patrol, priced £190. Born in Bolton, worn all over the world. The Reebok Club C is a true eighties icon. The recently re-released model has just received another makeover at the hands of Malaysian sneaker and streetwear boutique Crossover. Along with soft leather uppers, the court classic now boasts subtle perforations throughout, and a textured rubber outsole. Available at End, priced £89. When British firms reach their centenary, they get a letter from the Queen, or something like that. But for Finish running veteran Karhu’s 100th birthday, the brand has received a remix from Dutch streetwear dons Patta. The new take on the Synchron Classic is crafted from premium nubuck uppers, balanced out with durable mesh, pigskin leather lining and 3M reflective accents. Available from 17 December at Hanon, priced £125. The Best Men's Sweatshirt Guide You'll Ever Read This stylish comfort-wear goes with almost everything you own The Complete Guide To Men's Buzz Cuts It's time to take your hair back to basics The New Rules Of Formal Attire Is formal the new casual?